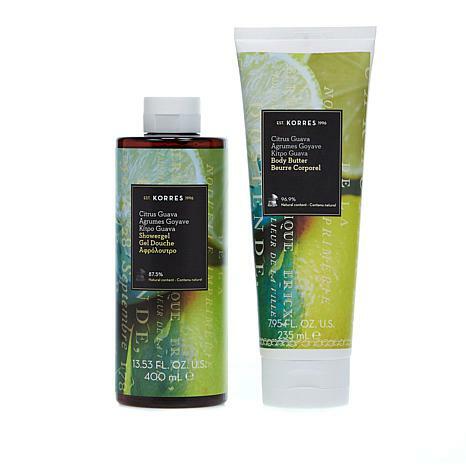 This duo includes a creamy foaming shower gel and luxuriously moisturizing body butter scented with the warm tropical fruit and fresh citrus notes of Guava Citrus. Ingredients: Aqua/Water/Eau, Cetearyl Alcohol, Prunus Amygdalus Dulcis (Sweet Almond) Oil, Glycerin, Coco-Caprylate/Caprate, Dicaprylyl Carbonate, Helianthus Annuus (Sunflower) Seed Oil, Dicaprylyl Ether, Squalane, Butyrospermum Parkii (Shea) Butter, Persea Gratissima (Avocado) Oil, Parfum/Fragrance, Cetearyl Glucoside, Alcohol, Alpha-Isomethyl Ionone, Ascorbic Acid, Ascorbyl Palmitate, Benzyl Alcohol, Butylphenyl Methylpropional, Eteareth-33, Citral, Citric Acid, Citronellol, Coumarin, Eugenol, Geraniol, Hexyl Cinnamal, Imidazolidinyl Urea, Lactic Acid, Limonene, Linalool, PEG-8, PEG-40 Hydrogenated Castor Oil, Phenoxyethanol, Potassium Sorbate, Pyrus Cydonia Fruit Extract, Tocopherol, Vitis Vinifera (Grape) Seed Extract, Xanthan Gum. Ingredients: Aqua/Water/Eau, Sodium Laureth Sulfate, Cocamidopropyl Betaine, Sodium Cocoyl Isethionate, Coco-Glucoside, Glyceryl Oleate, Parfum/Fragrance, Aloe Barbadensis Leaf Juice, Alpha-Isomethyl Ionone, Althaea Officinalis Root Extract, Arginine, Benzyl Alcohol, Butylphenyl Methylpropional, Castoryl Maleate, Citric Acid, Guar Hydroxypropyltrimonium Chloride, Hydrolyzed Wheat Gluten, Imidazolidinyl Urea, Lactic Acid, Limonene, Phenoxyethanol, Polyquaternium-7, Potassium Sorbate, Sodium Benzoate, Sodium Chloride, Sodium Dehydroacetate, Sodium Gluconate, Tocopherol. I love how you can feel the moisture and hydration immediately. It smells greet and feels very refreshing. 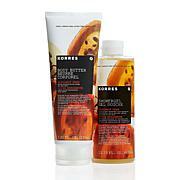 I live every Korres product I have purchased.